NASA's Curiosity Mars rover has been sending invaluable data back to Earth for quite some time now, but it's older cousin the Opportunity is facing a storm of epic proportions that has forced the rover to hunker down. The Opportunity has ceased sending signals after it was engulfed by a massive storm that spans at least 25 percent of the planet's surface. The Opportunity has been forced into hibernation by the massive storm which has kicked up too much dust for sunlight to reach the rover's solar panels which provide its power. Planetary scientists weren't surprised by the Martian storm which can typically span from less than 1,200 miles across to large enough to cover most of the planet's surface. This particular storm was detected May 30 by NASA's Mars Reconnaissance Orbiter (MRO). When it was first sighted, the storm was only around 620 miles from Opportunity prompting the rover's team to begin working on plans in case the storm engulfed the rover. By June 6, dust from the storm blocked out the sunlight needed for the rover's solar panels to recharge. Since then, the Opportunity has been severely limited to around half its power. June 10, the Opportunity transmitted data back to Earth showing the Mar's atmosphere as the record storm advanced. 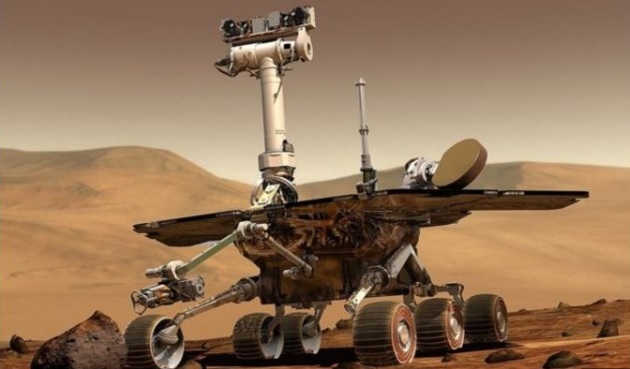 Since then, the rover has been silent and its team members have been unable to communicate with it. The team says the rover has likely gone into sleep mode while it waits out the storm until it can recharge itself via its solar panels. By June 12, the storm spanned 14 million square miles, an area large enough to cover all of North America.